For 50 years Friends Academy Summer Camp has believed that each child carries unique gifts and talents which we seek to nurture and celebrate. The primary goal of our summer camp experience is to develop each child’s self-confidence, support them in learning new skills and of course, have fun! Our beautiful 65-acre campus offers a perfect setting for all our summer programs. Our Dolan Center includes an air-conditioned dining hall, professional theater space and computer and art classrooms. Our air-conditioned classrooms offer additional space for our arts programs, science, computers, and a variety of camp activities. All classrooms are networked for computers, video instruction, and on-line services. 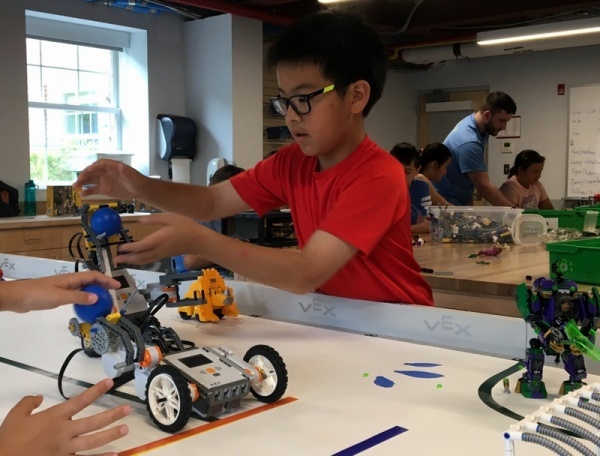 Our STEM programs allow student to develop their critical thinking skill, build interest, knowledge, and skills the campers can take with them into the classroom and beyond. Oh and sometimes, we get a little messy too! Campers swim twice a day and receive swim instruction from our Red Cross certified staff. The Summer Academy gives our campers (Ages 8-13) the freedom to design their summer! Campers choose an exciting program of interest each week! Click HERE to view a brief description of our 2019 program selections. Our flexible program schedule allows campers to experience different sports/electives or focus on a specific passion of theirs. Campers registered receive both a morning and afternoon session in a program of their choice, along with two daily swims, lunch and recreation time. Our Leaders in Training (LIT) Program helps campers learn about teamwork and leadership. Some qualifications we look for when selecting LIT's are emotional maturity, leadership potential, completion of LIT program and motivation for training. Year 1 LITs get mentored by our staff and are given opportunities to be a positive role model for younger campers. LITs learn interpersonal skills that will serve them well beyond high school and college. Our Travel with Friends Program offers both day and overnight trips to some of the greatest fun-filled destinations on the east coast. Campers visit amusement parks, museums, the beach and so much more! Each week is a new adventure! Click here to find out where we are heading.